Using the Selection Tool and the Export Georeferenced/Reprojected function to use TNP's maps in other applications. Terrain Navigator Pro has long been a go-to tool for GIS professionals who need to produce quality maps quickly and efficiently without the burden of a large full-featured GIS application. However, TNP is often used in conjunction with GIS software and related systems. 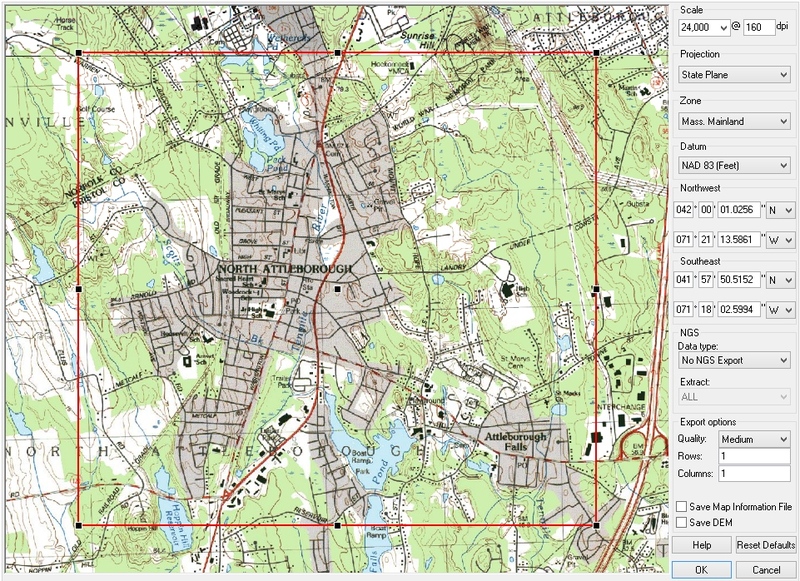 One example of this connectivity is to use the base maps (USGS topographic and Aerial Orthophoto) from Terrain Navigator Pro and insert them into another GIS application. The first task to accomplish when exporting a base map is to define the area needed using the Selection Tool: found on the toolbar. Set the map scale (also on the toolbar) so that the entire area you wish to save as a base map is in view. Do not be concerned about the map type or resolution – we'll adjust those later. Instead, use the Selection Tool to draw a rectangle around the area of interest. Note that only a few map types can be exported as georeferenced/reprojected base maps. These are: USGS Topographic (Standard, Shaded and Collared editions), Aerial Orthophoto (any edition), and Terrain Shading Only. Merged maps are not exportable. If a non-exportable map is in view, the option to Export Georeferenced/Reprojected will be disabled. Once the area has been defined, and the map type/scale set, open the File menu and choose Export, Georeferenced/Reprojected Map. (Or right click on the map or selected area, and choose Export Georeferenced/Reprojected Map). The Export Map window will appear. The left side of the Export Georeferenced/Reprojected window is a preview. The red box indicates the extents of the map that will be produced. These extents are also reflected as the Northwest and Southeast coordinates on the right side. Click and drag the red box as needed to refine the selection, or enter the exact coordinates of the corners. The options for projection, zone and datum specify the parameters by which the map will be configured. All maps must have some sort of projection (since a map is flat and the earth is not.) Terrain Navigator Pro offers several projections: Transverse Mercator (with state zones and datum/units [ft or meters]), Lambert Conformal Conic (with state zones and datum/units [ft or meters]), Rectify (which squares the map image), Universal Transverse Mercator (with nearby zones), Hotine Oblique Mercator (commonly used only in Alaska), and Web Mercator (commonly used for Internet-based mapping engines.) The projection of State Plane is offered as the state plane coordinate system is expressed using Mercator or Lambert Conformal projections – TNP picks the correct projection based on the selected state zone. Picking the correct projection is critical in providing the best quality map. However, there is no one "easy answer" as to which to use. The trick is to use the same projection across all aspects of the GIS project (if possible) so that the amount of distortion caused by reprojecting one dataset over another can be minimized. Generally speaking, Medium quality will produce the best results in a reasonable time. High quality is not usually needed unless the map is being distorted in a dramatic fashion. Low quality is best used for preliminary maps, or to produce a "quick and dirty" result. Once the map area and scale/dpi have been defined, Terrain Navigator Pro will automatically segregate the map into individual images, if necessary. This is done because the memory and processing required to manipulate a single large image is considerably more than for a series of smaller images. TNP determines how many images to divide the map into: vertical rows and horizontal columns. However, these can be set to be more (or less) depending on your needs. For example, TNP may recommend four (2 x 2) images, but for ease of use, you may specify a single (1 x 1) image. However, this may not be advised if there is a large condensation requested (taking a recommended 16 image, 8 x 8 export and reducing that to 1 x 1) as limitations on system memory and processing ability may hamper that effort. Check Save Map Information File to create a text document (along with the map image) that details various statistics about the map and its projection. Choose Save DEM to include Digital Elevation Model files for containing the terrain at two different resolutions. Terrain Navigator Pro includes a number of formats to save the map image. The one most widely supported by other GIS applications is GeoTIFF (Projected) as this embeds all georeferencing and projection parameters directly into the TIFF file. JPG (with JGW "world" files) and TIF (with TFW "world" files) are also sometimes compatible – but may require specifying the projection selected during the export process to the receiving GIS application. The option to Export Georeferenced/Reprojected is disabled ("grayed out"). Why? First, be sure that you have a map type selected that is licensed for georeferenced exporting: USGS Topographic, Aerial Orthophoto, and Terrain Shading Only are the only map types licensed for georeferenced export. Satellite Images, Street, and Terrain Outdoor/Contour maps are not able to be exported – due to licensing restrictions placed on them by their provider. Some map types revert to other map types at extreme scales. For example, when the map type is set to Aerial Orthophoto and the scale is set to 1:36,112 (or larger), a Satellite Image (street hybrid) is used instead. Be sure to set the map scale to 1:18,056 (or smaller) to ensure the desired map type is actually in view. I want to include the map collar information as is printed on the original USGS topographic map; is that possible? Yes. Set the map type to USGS Topographic and then the edition to Standard USSG with collars. Set the map scale to 1:36,112 so that the quad sheet (and its collars) begins to come into view. Use the selection tool to select the entire area (including the collar.) Note that the selection line is clipped when it reaches the map edge which makes it invisible outside of the map area. (This is done so that the collar text is unobscured.) Use the positioning boxes to determine the proper placement of the selection (or drag the "invisble" line as needed.) Tip: Hold the CTRL key to temporarily revert to the hand/drag tool when the Selection tool (or any other tool) is active. Once the map area is selected use File, Export Georeferenced/Reprojected as with any other export. Note that the preview may not show the collar information; but it will be included on the exported map image. Can my markers, routes, tracks and other project layers be included on the exported map? No. Instead use File, Export, Markers/Routes/Tracks to save the layers into GPX, KML/KMZ, Shapefile, or similar format. Then import those layers separately into your other GIS software. For layers that are not supported by the export feature or format (such as range rings or polygons) right click on the layer and create a marker, route, or track – as these basic layer types can be exported in universally recognized formats. Why does my map image get spit into four (or more) parts? Can this be disabled? 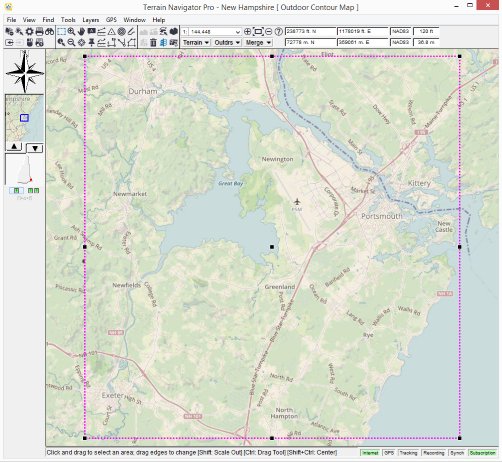 Terrain Navigator Pro sets the rows and columns for the export area based on the minimum processing/memory needed to produce the map at the selected scale and dpi (resolution.) In short, the larger the area and the more detailed the resolution, the more processing power and memory the export operation will require. Once the area, scale and dpi have been set, you may override TNP's suggested rows and columns at the bottom of the export window. Set them to 1 row, 1 column to create a single map image. However, be aware that creating too large of a map image may result in an unexpected shutdown of TNP, or the software receiving the map may not be able to handle it as one large image. Why does Terrain Navigator Pro export 2 .DEM files when exporting Elevation data.